I know, I know. I promised that when I announced my pregnancy that I wouldn't overwhelm the blog with "mommy posts" and I won't. BUT I will make a disclaimer that I am going to talk about some of my experiences here, especially from the perspective of a pregnant working wedding photographer. There are so many woman photographers out there who "struggle" with the idea of incorporating a pregnancy into their business life, and I have to say I was (and sometimes still am) that person. So I want to write, lightly, about this topic in hopes that it will inspire and encourage other woman photographers out there that yes, you can be pregnant, have a baby and still run a successful and thriving business! (With a balanced and realistic approach of course:)). Since I've been asked A LOT about what it was like shooting in the First Trimester, I'll start there. I found out, or rather got suspicious, that there might be a baby on board when I was shooting Jenny and Joe's wedding back in August. It was a relatively mild summer day but I swear I could have been sweating buckets. The massive Catholic church was cool and air conditioned but I felt like I was being smothered by the humidity (there was none, by the way). I distinctively remember standing at the altar thinking I felt like I might pass out. I was dizzy, overly hot and feeling rather "icky". I ran to my amazing second shooter, who then ran out to the car and brought me some water. I made it through and felt so much better once we were outside. Welcome to shooting in the First Trimester. -- Make sure to have a reliable second shooter with you at any wedding you'll be shooting while pregnant (perhaps even thinking about bringing an assistant as well). I know this might seem like common sense, but it's true. Having a reliable team with me during that First Trimester (and into my Second) made every minute of shooting so much better than if I had gone in alone. With pregnancy you cannot control what happens (and really ANYTHING could happen). For my own peace of mind, having someone there was very important. I wanted nothing to interfere with my client's day. -- Bring snacks. Often as wedding photographers we don't eat. Whether it's missing that lunch time because you're traveling to a wedding or because a venue forgot to feed you, meals are just not a guarantee. And eating while pregnant is so hugely important. While I felt nauseous, I knew I had to keep eating so I kept my Think Tank roller FULL of easily accessible snacks. I'd pop a few in my mouth during the ceremony, the family formals, the cocktail hour, any time that I needed a little pick me up. And they kept my belly and baby happy. -- Bring water. If there is one thing you should never forget to bring (besides your camera;)) it should be water. I attached a carabiner to my Shootsac and hung a water bottle on it to make sure that I had water on me at all times. Making a baby takes a lot of your energy! Add in a wedding day (and we all know how much energy that takes!) and you've got yourself one tired photographer. Water helped me to feel refreshed, hydrated and energized. It's also a huge requirement of mothers to be to make sure that they drink lots and lots and LOTS of water during the day. -- Make room for pee breaks. This is where a skilled second photographer comes in. When you're pregnant you pee A LOT. I felt like I was constantly telling my second shooter that I had to pee. I managed to squeeze in breaks in between important events, but in the rare case, that I knew I had my second shooter there to take over as necessary. -- Listen to your body and take time to rest. I'm a person that likes to go go go. I'll push myself to keep going even if I know I shouldn't. There were a few (VERY FEW) moments during the First Trimester where I might have pushed myself a little bit harder than I should have. It's hard, sometimes when you're not showing, you forget that you're pregnant so it's easy to go faster and harder. But making sure to listen to your body is hugely important, not only for you and your baby, but also for your clients. Rest will enable you to perform your job to the best of your ability. If you're feeling tired or achey, take five minutes to take a deep breath and sit down. It will make the rest of the day that much better. -- Ginger candies are a must. For me my go to product to fight morning sickness was a little "candy" called Preggie Drops. They helped to instantly take away any nauseous stomach I might have had and helped me refocus on the job at hand. They certainly were a life saver in those early weeks especially right before a ceremony where I knew all my attention would be focused on the couple, not my icky stomach. -- Be prepared for exhaustion. Fatigue is a HUGE part of the First Trimester. And I don't just mean you feel sleepy. You feel WONKY! I often found myself randomly falling asleep on the couch (I even feel asleep and drooled on our dog!) during those first few months. So keep this in mind while you're shooting. You are going to be VERY tired after a day of shooting. It typically took me a day or two to recover from one wedding. But I knew that this was only for a season of time and so I planned accordingly, not scheduling any shoots or appointments the day after a wedding. I knew full well that I would be asleep on the couch and probably drooling on the dog the following day;). For me the nauseous symptoms, the exhaustion, the fatigue, all started to wane around nine weeks. By the end of September I found myself feeling "better" and shooting weddings felt "normal" again. Of course a whole host of other symptoms soon arrived (aches, pains, and a growing waistline) but nothing that I felt could drastically interfere with my job. Looking back, I'm very grateful for the experience! It helped me to realize that, with help and proper planning, I CAN DO THIS! It is possible to shoot and work while pregnant and I'm grateful to have been able to continue to do what I love most, SHOOT WEDDINGS! 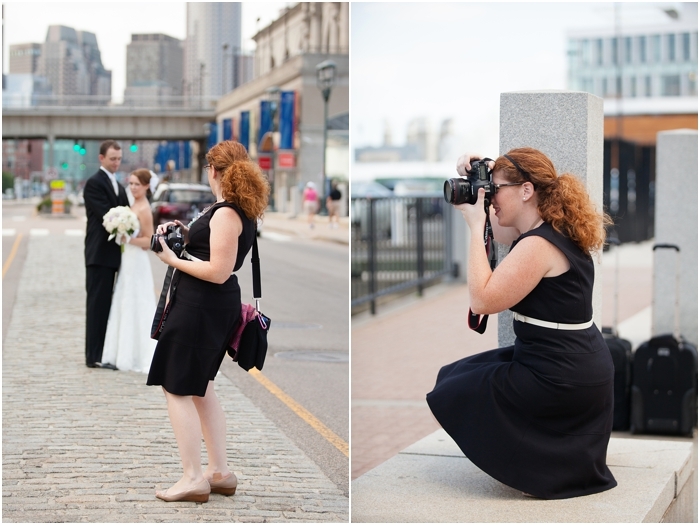 Here I am shooting Rob and Rachel's wedding at seven weeks pregnant, in a dress, during a double header weekend and STILL HAVING FUN!I will say that every pregnancy is different. My experience could be drastically different than yours. BUT this is what I did to prepare and "survive" those First Trimester symptoms during the first three months of pregnancy and wedding season. It can be done, it's not as horrifying as you might imagine and with a little planning and patience, it can actually be a really enjoyable time! If you have any questions or want to continue the conversation, leave a message in the comment section below or shoot me an email! I'd love to hear from you!